In our last posts, we have talked about that we are interested in if the possible output is able to trigger the input condition. The expected output and input condition are key-value pairs connected with logical operators (&&, ||, !). We define the output expression as A, and input as B, and we are wondering of their is an implication between them (A->B). Partial Trigger. If a set of certain cases of A happens, B can happen under a certain environment (A–>B), which means A is not enough to trigger B alone but it does contribute. To prove A->B, Automated Theorem Proving is applied. However, a simple deduction (A->B) can only help distinguish the complete trigger from the rest. To differentiate the possible trigger from the last two, we have to transform the output expression to a Disjunctive Normal Form (A1|A2|…|Ai), if any Ai -> B, then it satisfies the definition of a possible trigger. To tell apart a partial trigger from irrelevant needs even more computation, my method is to transfer the input condition into a Conjunctive Normal Form (B1&B2…&Bj), if any Ai->Bj, we know it is a partial trigger. Otherwise the output and input are irrelevant. In order to create Axioms for theorem proving, we have to compare the values belongs to the same keys, the values can be either a constant string or a regular expression. And the challenge is to find out the overlaps between two regular expressions. As a solution, we can transfer regular expressions to Deterministic Finite Automatons (DFAs) and derive their intersections. Here is a concrete example explains how it works. Obviously there are only two words matches both expression, they are hat and cat. We can see that DFA 1 is enclosed by DFA 2. So the intersection is DFA 1. The latest choice to create an interactive UI is DOT Language + Grappa Applet + JSP + Jersey Framework. However, Grappa doesn’t support automatically layout a DOT file, the graph formatting relies on the external invoking of GraphViz tool, which could be a potential issue for our cloud server. In the worst case we have to revert back to a static/non-interactive UI. We keep it as simple as possible temporarily. Graph design can be more specific, e.g. the node shape and line style should follow the workflow description model. Storlet Code, provides the basic functionality/template of the storlet, which is created by programmer. As a user, the hard coded part is a black box and immutable. Trigger Evaluator, which specifies the trigger condition in a special logical operation. This part defines both the input and output logic expression. It is not required for a end-user to understand the logic, but a user can always add extra conditions for strengthen the constraints. Variable, which expose the interfaces from layer 2. A common user just need to know what is this storlet used for, and simply specify those variables. Basically, the variables are inputkey, inputvalue, outputkey, outputvalue. Somehow, there might be multiple outputkey and outputvalue for a single storlet, in that case, we assume the output can be any combination of these keys and values. Study workflow description model, and apply it to my UI. DOT supports subgraphs clustering, all nodes in the same subgraph could have the same node and edge attributes. additionally they can be clustered in one group. These two features facilitates the representing of multiple handlers belongs to a single storlet. I will explain it in the following graph design part. DOT language also support HTML like attribute, and flexible syntax. Since the original web service framework is in Java, I switched to Grappa, a java graph visualization framework, which support DOT language and user interaction. Each node are created as a single handler of a storlet, it is good for cycle detection, because cycles are happened in handler level but not storlet. The annotations of a node may contain the information of storlet and handler. Edges between the handler may represent the satisfied condition of a trigger condition. To design the UI and programming model, first step is to analyze the possible user interaction. Currently investigating on Jersey web service framework, reading the existing APIs of the system, which is used to access to storlets information of a container. The language is straight forward, users could have a brief impression of the graph without plotting it out. NetworkX is elected as the preliminary graph programming package, besides pygraph and graph-tool are also very powerful libraries. Network is chosen because it support all three languages mentioned above, it provides powerful graph statistic analysis algorithms, especially the cycle detection api greatly facilitate our work. Instead, pygraph only returns the first cycle it detects and graph-tool only support DOT language, which is a serious limit. NetworkX usually associates with mabplotlib or pygraphviz for plotting graphs, both of them provides python APIs. However, the interface of the existing system are generally in java. It would be great to have a java plotting tool supplies more graph annotation features. Keep workflow of storlets information as objects in VISION Cloud, for migration to other container and restoration from corrupt workflows. However, I think if we can have all required annotations stored in the graph, migration and restoring can be done with the existing and snapshots of graphs. It is my 3rd day at SICS to do my master thesis. Let’s start from a description of my tasks and possible approaches. My thesis is a part of the VISION Cloud project of SICS. competitive cost while the QoS and security are guaranteed. My task is related to the “storlet”, which is the execution unit of the computational storage in VISION Cloud. These computations are typically data-centric, i.e., analyzing or transcoding newly uploaded or updated data objects in the cloud. A storlet is created by the tenant and stored in the storlet library as a wrapped component. Whenever a user performs computations in the cloud, he fetches the appropriate storlets, specifies the trigger conditions and injects them into the cloud storage. The trigger event could be any state change of the storage state, which is reflected by the update of data object metadata. A storlet might remain in passive state until it is triggered by certain event, then it becomes active and starts operation. Eventually, when the operation is completed, it turns to passive again. There are many use cases relies on the storlets mentioned above, e.g. media transcoding, Telco and health care. Most of the use case requirements expect an interface allowing to inject a chain/workflow of storlets automatically. However, the current implementation of this computational storage doesn’t support this feature. The only chance to connect two storlets is to predict the output of the first storlet manually and set an appropriate trigger condition for the second. Additionally, even connected storlets might form cycles, overlaps or starving. 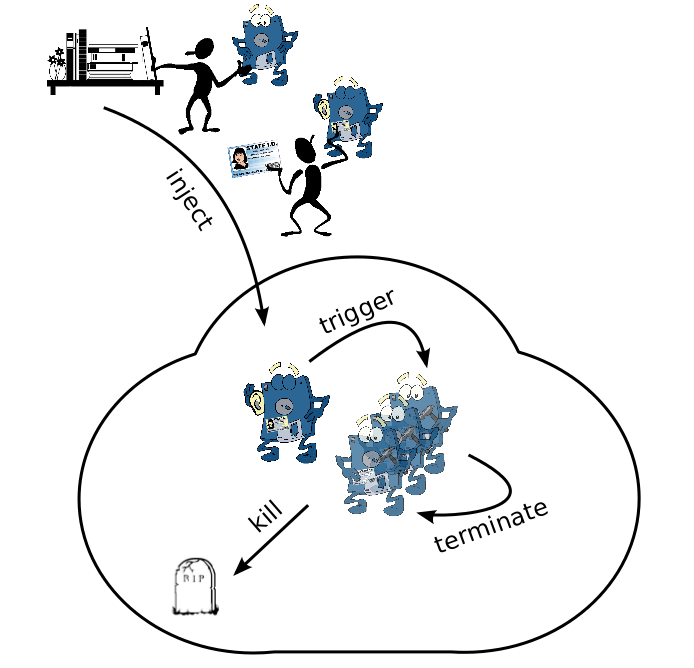 Whenever a new storlet is injected into the cloud, its trigger information is extracted and registered in the Notification Service (NS). When a state change of a data object happens, the Object Service (ObS) sends the event to the NS. The NS then check its registration, if some trigger conditions match the event, the registered storlet is triggered to become active. Since the output of a storlet might trigger another one, we treat the storlets distributed as a graph. However, the triggers between storlets are indirect, some mechanism is required to generate the graph. Produce an algorithm to extract and predict the input and output information based on the storlet programming model (a new model with the properties is by design right now), analyze all possible connections and definitely not possible connections, then generate a potential graph. All potential issues would be discovered before new storlets injected. Definitely not possible connection information is useful when isolating storlets. Helps to exclude the possibility of cycling for failure detection. Big overhead, analyze possible input and output is expensive. Change the programming model is a challenge. Use a machine learning algorithm to generate graph dynamically with trigger event logs. Efficient problem detector, able to kill storlets while cycling is noticed. policies of injecting storlets can be learned heuristically by cycles are observed under certain situations. Rare completely secure injection of storlet. Not friendly to user when storlets killed automatically. The round trip time is estimated roughly in this version of my program. I use GeoIP APIs to tell if the source and destination pair are from the same country, same continent or different continent. And set a specific RRT to each case. Globus APIs doesn’t return RRT for each underlying command, and only RETR command is interacted between source and destination servers, the rest are all about client and servers. From the experiment, I tested this approach with several different rough RRT, and they all converge to a good result eventuality. Since in half to one year, the RRT of third party transfer monitoring mechanism will be implemented in FTS, we can obtain more accurate optimal result at that time. New version: Default input parameters are RRT, TCP Socket Buffer Size, Number of streams. Reason: It is more intuitive since bandwidth is not easy to estimate at very beginning without any information. Choose a more proper default configuration avoids exceeding. Reason: It was a mistake, the goodput is already a sum of all streams. Expectation of the algorithm, the derived number of streams and buffer size converge to an optimal domain, regardless of the first guess of bandwidth, but a relatively closed RRT is required. (ex. If the best number of streams is 50, it drifting between 40 – 60). Furthermore, to experiment with multiple default RRT and choose the best one is a good approach to me, because the current infrastructure doesn’t provide RRT in a 3rd party transfer. But if the default RRT is too far from the real RRT, the algorithm makes result converge to another domain because of the inaccurate RRT. In terms of simultaneous transfer, it highly depands on the memory management of the system. My task is to figure out if the optimal number of streams (connections) is 100, what is the best combination of simultaneous transfers and number of streams. Now, have a nice weekend to Lausanne !!! !